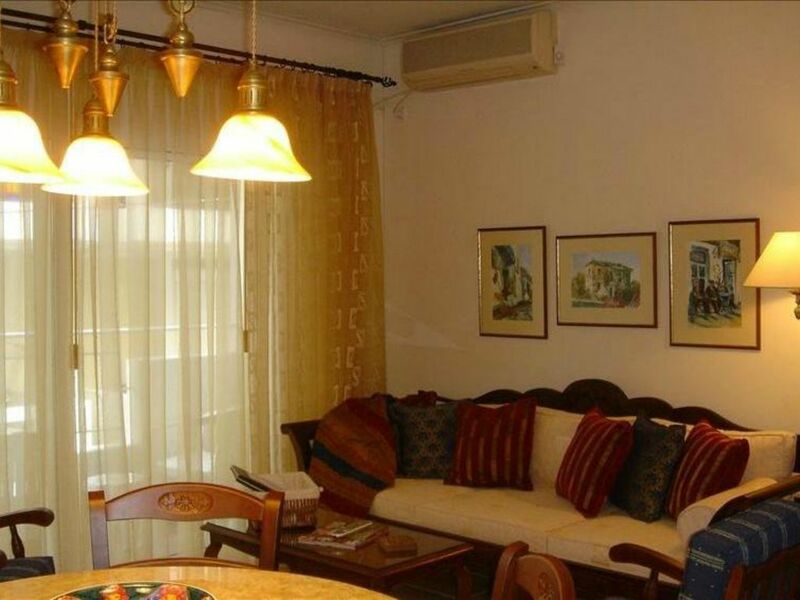 Heart of Athens Luxury Condo-Free Wifi-Walk to Ancient Sites! The 'STRATIS' is your Home away from Home in the center of Athens, which gives you the best of two worlds. It is entrenched in the heart of the antiquities and shopping, a stone's throw away from many historical archeological finds and still nestled in a quaint location. Just a few minutes walk to many of the major sites: the Acropolis, the 'New' Acropolis Museum', Zeus Olympius Temple, Adrian’s Arch, the Marble Stadium, National Gardens, Plaka, Syntagma Square and so much more! The Metro and Tram are also just minutes away to easily take you to the beaches, waterfront restaurants and other surrounding suburbs. This deluxe condo is in the quaint neighborhood of “Metz” that offers fresh food markets, bakeries, a pharmacy, video store and local restaurants. So the convenience to everywhere is never a question - location is fabulous! Located on the second floor of a newly constructed six story building, this condo is beautifully decorated with a taste of Classical Greece brought into the 21st Century. With two bedrooms and 1 and 1/2 bath, it comfortably accommodates up to 4 persons. Whether you are visiting the city, traveling the mainland of Greece or on your way to and from the infamous islands, you will have the luxury of the conveniences of your own home with a washer and dryer, two TVs, DVD player, stereo system and air-conditioning in every room. We also provide WiFi for those who want to stay connected to the rest of the world! The fully equipped kitchen affords you the option of a quick bite to eat or preparing a full meal before you venture out to the sights and sounds of Athens. Imagine being able to return home from the day's adventure and relaxing with some feta cheese, Greek olives and a glass of Greek wine before returning to the exciting night life of Athens! The options offered are endless! The “Stratis” is the perfect alternative to staying in a hotel! My mother, siblings and children live in the northeastern part of the United States. Although we have traveled to Greece over the years, having our own home now allows us to visit several times every year. Most of our friends and family still live in our neighborhood. It could not be better! All of us speak the Greek language and are familiar with Athens and other parts of the country. We would be happy to help where we can to make your trip more pleasurable. Thank you for considering our Athens home! 'The Stratis' was built in 2005 on the property where our family first immigrated to Athens from other parts of Greece over 100 years ago. Although there were many memories made throughout the decades, we chose to re-build with all the modern conveniences so that our family and friends could enjoy our home for many more years to come. We are located less than 30 minutes from the airport and the major ferry port, where we are able to leave for day cruises or longer. Public transportation and taxis afford us the luxury of being able to go to the local beaches and mountains for the day. There are also car rental companies within a few blocks when we want to travel through the mainland of Greece. Our condominium becomes home base so we can visit with family and friends and still vacation. It is truly our 'home away from home! Our condo features individually controlled air conditioning units in every room as well as ceiling fans in both bedrooms. Traveling during the cooler months? We have heating units or radiators. Travel lighter with the convenience of a washer and.......yes, a dryer! No need to wait for clothes to dry outside. A rare feature while traveling is the added benefit of a dryer. Iron and ironing board provided. Public Parking garage one block away. The kitchen includes a full size refrigerator, oven/cook top, microwave, toaster and coffee maker. The living room has a state of the art flat screen TV. Want to unwind when you go to bed? We also offer a TV in the master bedroom. Our first visit to Athens and a perfect location close to the Acropolis and walking distance to great restaurants. The accommodations are perfect to stay and has all the comforts of home away from home. More importantly, glad to have Marika greet us and tell us about the area. If you ever need a friend, Marika saved me in an emergency when my cell phone got wet. She recommended a cell phone repair service that truly are reputable. We definitely would stay here again! The apartment was very clean, cozy and the right size for a family of 4, including 2 young teenagers! we were greeted by Marika with a goodie basket and lots of helpful information. The apartment is near a busy street but you do not hear the traffic. Bus, trams and metro stops are steps away, as is a bakery and grocery store. There are several small restaurants in the area or within short walking distance. The Plaka, Acropolis Museum and other important sites are within 10 minutes walking. We walked back to the apartment several times late at night and always felt safe. Urania and Marika were of great help, they answered all my questions and made valuable suggestions even before we arrived. We were there during the rainy season so having a washer and dryer made a huge difference. We highly recommend the apartment to others, especially families. Everything about this Greek condo was excellent. Urania and Marika were awesome to work with. The condo was super clean. It was walking distance to all the tourist sites. Marika was available to help with everything. The welcome basket was unexpected and a wonderful touch. The use of the washer and dryer was also a bonus. We used the recommended driver who was English speaking and very professional. We hadn’t booked them on the return because we became busy and the day we were leaving there was a taxi strike and Marika and the driver went over and above to make sure we got to the airport in time. I highly recommend this property. Markita was wonderful! Condo was very clean and cozy! Walking distance to all the attractions in Athens. Metro is in walking distance. Very safe neighborhood right around the corner is great reastraunts market bakery pharmacy every thing you need. After a long day of sightseeing it was wonderful coming home to our cozy condo.if you plan on going to Athens this is the place to stay! Thank you markita for being a wonderful host and thank you for letting us stay in your beautiful home! This was our second time staying at the Stratis apartment and would stay there any time we are in Athens. The apartment is very comfortable, clean, and close to everything a visitor wants to do in central Athens whether going to Acropolis, Syntagma or Plaka. Urania responds quickly and answers any questions; Marika is absolutely a gem and has the apartment clean and ready and is ready to help with anything needed. Meeting members of the family and sharing a cup of coffee and wonderful conversation with them was such a pleasant experience. Thank you to all for making our stay in Athens very pleasant. Excellent condo in perfect location. Really appreciate the modern appliances and that everything needed was there - toilet paper, dish soap, etc. The last thing you want to do on a short trip is have to purchase these little things. The property manager Marika was very helpful and within a 2 minute walk you can find bakeries, cafes, restaurants etc. Walking distance to Placa. Would not hesitate to stay here again or recommend!! Thank-you!! Rates are subject to change until reservation is confirmed. The primary guest must be 25 years or older. We have a standard rental agreement to be accepted at time of booking. Review agreement for detailed payment schedule and cancellation policies.